The Lawrence Face takes a direct line up steep rock and snow to reach the west ridge close to the summit. From the lower Lawrence Glacier, climb scree slopes to the foot of a steep rocky buttress, between the two main icefalls, that rises almost to the summit. Follow the buttress to a snow-filled couloir that leads to the upper ridge. Continue on the Lawrence Col side of the ridge until a large schrund is reached. Cross this and take a short couloir to the summit ridge, then traverse over several bumps to the summit. This rock is loose but not especially difficult. From Lawrence Col follow the tricky ridge, keeping on the Reischek faces as much as possible. 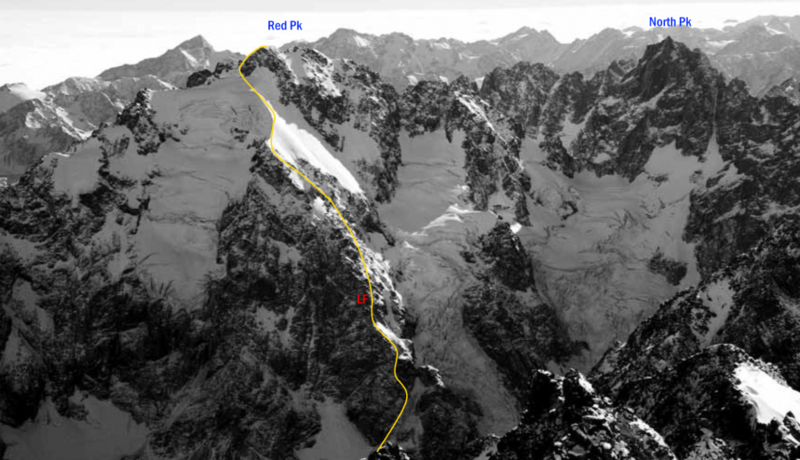 The large gap in the ridge west of Pt 2539 metres is passed on the Reischek side – start the traverse well before the gap. Alternatively, in good conditions, climb directly to the gap to avoid the first section of ridge. Follow loose rock on the North Arête to join the summit ridge east of the summit. From here traverse numerous pinnacles to the top. From the Reischek névé a distinctive spur juts out from the main Red Peak massif into the glacier. A small snow col on this spur provides a starting point for a climb up faces of reasonably firm rock leading directly to or just west of the summit. 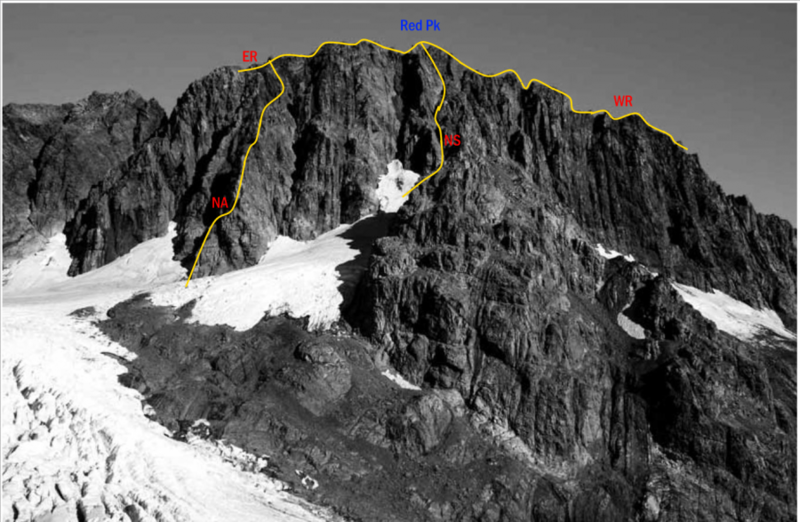 This is the most commonly used ascent route. From the Reischek Glacier head around the névé under the peak and follow snow to the col between Mt Gould and Red Peak. From here easy climbing on loose rock slabs leads to a short ill-defined ridge which merges with the upper northern face, then follow a series of short sharp gullies to the summit.